Pickled Watermelon Rind - Canning Homemade! Now this recipe was totally out of the blue. My son Jake loves watermelon and I was in the middle of cutting one up and it hit me that this rind was going to end up in the composter. I figured that either the worms were going to get it or I was going to figure out if it was edible. Needless to say, here is the fabulous recipe for a "sweet like" pickle that has all the crunch with a new fun taste. The funny thing is that my mom and dad remember them from their youth but I have not found many people here in the "city" that don't think that eating a watermelon rind is weird. Be courageous and Enjoy! Peel green skin and cut off inner pink from watermelon rind; cut into 1-inch chunks and measure 4 quarts. Put in a non-metal bowl and add the water and salt. Add more water if necessary, to cover the rind chunks. Cover and soak overnight in refrigerator. Drain and cover with clear water; transfer to a large saucepan or Dutch oven. Bring to a boil and continue to boil for 30 minutes; drain. Pour vinegar into an 8-quart kettle; add sugar. Tie spices in a cheesecloth bag and add to vinegar mixture. Bring mixture to a boil. Remove from heat and let stand for 15 minutes. Add the drained watermelon rind. 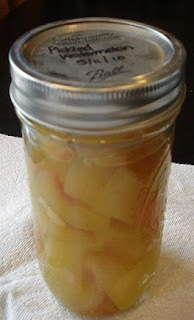 Boil gently until rind is transparent and syrup is slightly thickened, about 45 to 55 minutes. Remove spices 15 minutes before done. Spoon into hot sterilized 1-pint jars, leaving about 1/2-inch head space, and seal. Process jars in boiling water bath for 10 minutes. Makes about 4 pints.